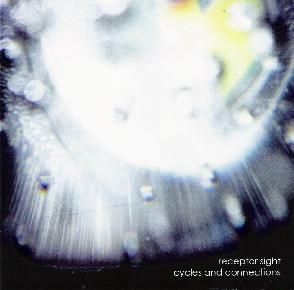 Receptor Sight - "Cycles and Connections"
Receptor Sight is the project of two brothers based in Mt. Shasta, California. Being a biologist, I love the description in the bio of this CD, "…would be a good soundtrack to a neuroscience textbook". This is the duo's second release and the tracks range from 6 seconds to nearly 14 minutes, and you hear a wide range of instrumentation in these bizarre dark brooding soundscapes. "The Basal Ganglia Forest" has really cool bass and hand drums that create a really cool intertwining sound. "The identification Toss" is basically a noise drone that leads into "Fourth Song", which features a real drumkit (first on the CD) and a real track that builds up into something very interesting over the 8 minutes. "Slowed Down Thumb" takes you into a Tibetan temple like place. "Bagel and Green" is a 13 minute track with guitar, bass, drums and other strange sounds mixed in for head candy. While the track is slow and very repetitive, it slowly builds, much like Circle, before floating out into your minds space and taking off again. "Escape Velocity/The Receptor" closes the CD with a slowly building 14 minute journey to your synapses. A very unique sonic journey is created during this track. Cool stuff. Bands like this need to have underground film producers as good friends. Click on the links on the bands web page and this will give you an idea (I guess) of what bands have an influence on the music they are making. For more information you can visit the Receptor Sight web site at: http://www.receptorsight.com. Visit the Joyful Noise Recordings web site at: http://www.joyfulnoiserecordings.com.